Being born and brought up in a very poor family, Dr. Ngangbam Shantikumar Meetei's parents had to move from place to place in search of livelihood. Wherever the parents moved, all the kids had to follow. His parents never knew the meaning of Saturday or Sunday or Holidays as they had to work for almost 365 days a year. The only holidays they could afford were those days when they could not work due to sickness or have no work. Even as they worked hard they sometime missed both the meals. So, in order to support his parents and to keep the fire burning, all his brothers engaged in works while missing out on their basic education. Mentioning about their studies, Dr. Ngangbam Shantikumar Meetei recalling those winter mornings when he had to sit without warm clothing on the sack (bora) spread on the wet morning grass fallen from the midnight dew, just to learn something. The place he still recognized is Kanglatongbi along the National Highway when he came to know about their first settlement. Every morning after school, he had to lead a few cattle to the open fields away from home to raise his family as a means to earn. Coming back to his home with an empty stomach, he used to carry bunch of dry firewood on his little shoulder for the kitchen. And this was his everyday chores. 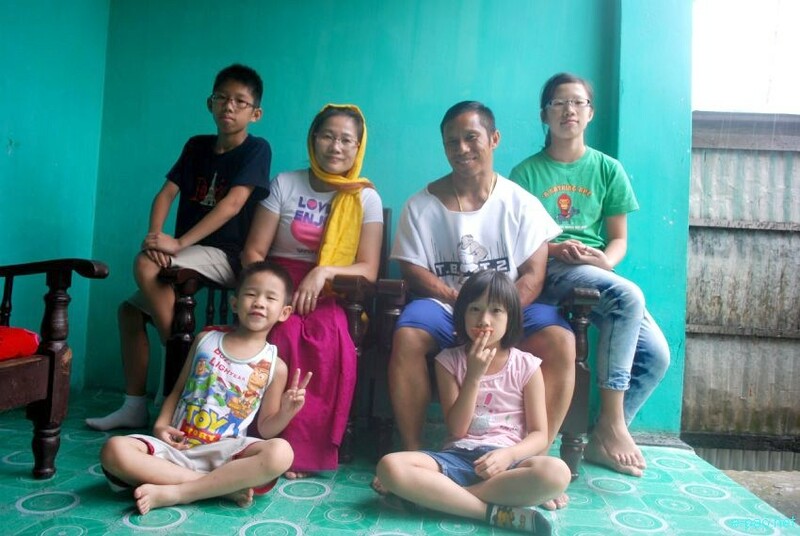 From Kanglatongbi, Shantikumar's family moved to Naoremthong, then to Sagolband Moirang Hanuba Leirak where they finally settled. He studied till Matriculation at the Rural Institute at Tera Sapam Leirak. Then he continued his studies at DM College of Arts and Commerce. After passing his BA from DM College in 1989, he joined the Jawahrlal Nehru University in New Delhi and completed his Masters and one year M. Phil and Ph. D in Linguistics. After studying in JNU for eight years, Shantikumar Meetei finally got his Ph. D. degree in 1998. But studying in JNU came with a big financial burden. He had to shed tears almost every night and slept on his wet pillow and also unable to close his eyes on facing his financial crunches. The first two years, his brother Manglemjao who was an Engineer used to send him Rs 500 per month. In the 3rd year, his brother Ibocha helped him by selling out a piece of land and he also asked his brother Ibobi and his uncle to send him money but they were as poor as his family. So Shantikumar Meetei decided to support himself. He did anything he could to support himself. He goes for tuition class as teacher, he worked at Delhi airport during night shifts. Not missing classes in the day apart from doing the odd jobs at other free time to earn, he managed all these inspite of the difficulties. He could not pay his hostel mess bills. His name always appeared on top of eviction list of fee defaulters. But the Hostel Manager knew Shantikumar well and considered his request. This continued for another four years in Delhi earning and studying together. Besides his sufferings from financial problems, Shantikumar suddenly lost his mother in 1990. He could not meet his mother before she passed away as he was deeply concerned in earning and studying. But in his last One and half years of his study, his (would-be)wife from Taiwan supported him to finish his Ph.D. With so many problems in life, he never quit his studies. Shantikumar got married with Ms. Ng. Chen Nan Tai in December 1996 after they came to know each other while attending the International Culture & Sports Festival in Seoul, South Korea in the year 1995. They have four siblings among them are two sons and two daughters. The first daughter Ms. Ngangbam Chen An-ning is reading in class X, while Chen Hsiou, Chen En-Hsien and Chen Hsiu-SHR are also studying in lower classes. 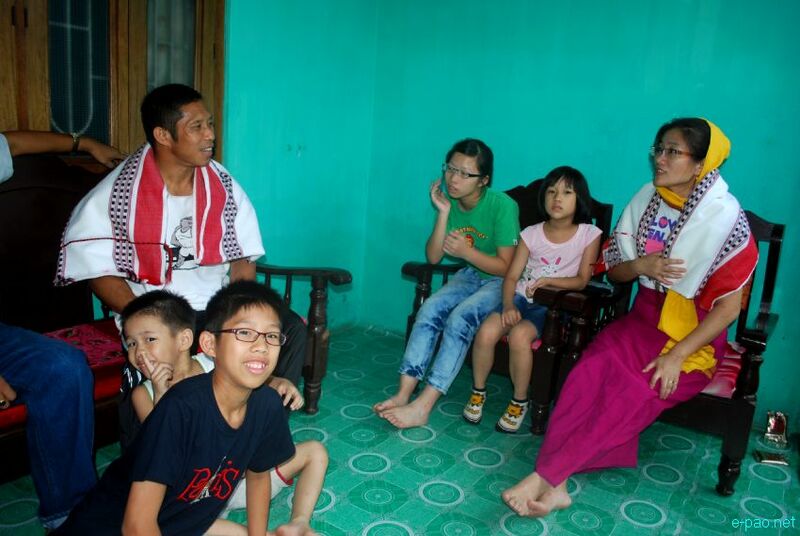 The last son and daughter is visiting Manipur in July 2013 for their first time; the family has been in Manipur for four time after their marriage. Shantikumar's wife Ms. Ng. Chen Nan Tai while appreciating the people of Manipur for the encouragement and the hospitality she enjoyed in Manipur, said that where ever there is love there is a home. Ms. Ng. Chen Nan Tai after completing her Masters in School of Sociology from National Jen Chi University at Taipei city in Taiwan is now serving as an English teacher in Global Educational Institute in Taipei. Besides his seriousness in study, Shantikumar Meetei was and is a hard-core lover of sports and played weigh-lifting, power lifting and particularly body building where he started from PMKHL club under the guidance of Labango, Robindro and Mr. India Maipak. During his stay in Delhi, he joined various competitions and won Mr JNU title, Mr. Delhi title three times, Mr. North India three times and overall title 1 time. He represented JNU in the All India Inter University and got 6th place and also represented Delhi state in Mr. India contest and was placed in 10th position. Today, Shantikumar Meetei is settled in Taiwan leaving behind his other family members and is serving as an English Professor in De Lin Institute of Technology. Till now, Shantikumar Meetei has achieved various titles including Mr. World 2013 and also Mr. Asia title. Representing Taiwan, he has achieved Mr Hongkong Invitation, Mr East Asia, Mr Asia titles. He competed in two Asian Games, one in Busan and the other in Seoul in 2002 and 2006 respectively and was placed in 6th position. He also competed in Mr. Universe five times and was placed his best in 9th position. All these achievements are still not enough for Dr. Ngangbam Shantikumar Meetei, as he aim to achieve the coveted "Mr. Universe" title at least once. His latest title was Mr. World 2013 held at Zakynthos in Greece in June 2013 organised by International Natural Body Building Association. Even though, Dr. Ngangbam Shantikumar Meetei is no more a citizen/resident of Manipur nor India, but his heart is still in Manipur, he loves Manipur and even as he is physically far away from Manipur and a citizen of Taiwan on paper, his heart still beats for Manipur. In a way to encourage body builders of Manipur under the guidance of AMBBA, Shantikumar has organized State Level Dr. Ngangbam Shantikumar Open Classic Body Building Contest from 2004. It is held after every two or three years, the second one was held in 2006, the third and last one was held at GM Hall in 2010 and he is planning the organized the fourth contest in 2014.